R. Dana Pest control provides Westchester and Rockland Counties, as well as the surrounding New York and Northern New Jersey areas with residential animal and pest control services. We start protecting your home by conducting a thorough inspection with a focus on areas that attract pests or allow them access to your house. We’ll offer you advice on how you can control pests through preventative steps, and our technicians will perform an initial treatment to rid your home of any existing pests. We will then suggest an ongoing maintenance program for your home. Whether you need help with termites, animal trapping, or other pest control, we're here to help! Squirrels are known as the most destructive rodents because of their chewing habits. They are also known for being persistent. If squirrel removal is not done in a timely manner, it can lead to a number of possible disasters. 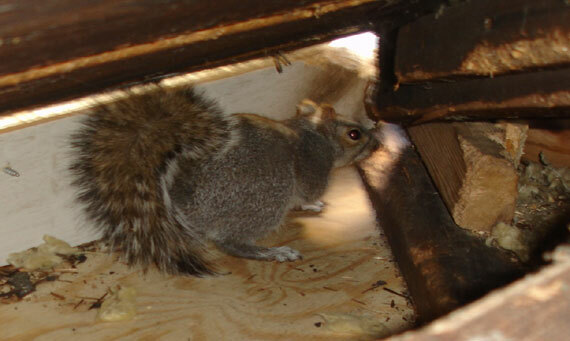 A squirrel may chew wood, wiring, and displace your insulation. When your insulation is mostly gone, your furnace or AC unit has to work twice as hard to keep your home comfortable. Chewed wiring can also lead to electrical fires, and a chewed roof can let water and snow into your attic. A squirrel's teeth grow approximately 6 inches per year. This is why they chew regularly on anything that is available, and why we urge squirrel removal to be ordered as timely as possible. We make sure to provide a generous amount of mesh to the surrounding area of the squirrel's entry point. This prohibits any future chewing or re-entry into that area. We provide a 2-year warranty on our work, however we cannot provide warranty for other areas of your home. This is why we've designed a prevention package for customers who wish to be done with their animal problems permanently. Conventional raccoon or squirrel removal from your attic can be done by placing a 1-way door contraption device which is attached to a galvanized carbon steel mesh. This mesh does not rust, however the color dims after some time. This method ensures that the animal in question will use its specifically designed 1-way to leave for its daily needs, but will not allow it re-enter into the attic. Alternatively, trapping will be the last option. We seldom use trapping as it is a last resort method. We find putting stress on animals to be unnecessary, but we also understand that at times, there is no other way. If you're looking for raccoon control or rodent control in Northern Westchester County or the surrounding areas, call us today to find out which is the best option for you and weâ€™ll be happy to assist you. Once we've found the point of entry where bats are roosting, we deploy a special screening on the area where bats are using as an entry and exit point. The exclusion system works in a way that bats can easily crawl and squeeze through to leave, but are not able to ever re-enter. This is using the bats abilities and weaknesses in flight against it. Once the screening is in place properly, other potential gap areas of the attic must be sealed. This job can be done with transparent caulking designed for exterior use. After a week or two, we will return to the attic and make sure we see no visual signs of the bats. When we are sure there are no more bats in the attic, we will remove the screening. To prevent bat re-entry in the future, the gap where the screen was installed will be closed with caulking exactly like the other gaps were done previously. This procedure will conclude complete and humane removal of bats from the attic. Please note: we do not perform bat removal during baby season. Not Sure Who's Bugging You? If you hear noises in your walls or coming from your attic like scratching, crackling or rustling, contact us today! Any number of pests including insects, rodents or other wildlife could be the culprit. Our team is specially trained to locate the source and rid your home of problems quickly. Season after season, your home is exposed to different types of pests. Roaches, ants, spiders, birds, bees, wood-destroying insects, blood feeding insects, and rodents will all be trying to make a home in yours. To make sure pests don’t return, you can have a program designed to suit your needs. We have programs to fit every issue and every budget. Weekly, monthly, bi-monthly, quarterly, semi-annual, Dana Protection Program and "on-call" services are available.